Product #5913 | SKU 2765X00220 | 0.0 (no ratings yet) Thanks for your rating! The AKG CK33 is a modular hyper-cardioid microphone capsule designed for use with the AKG GN series, HM 1000, and LM 3 gooseneck, hanging and lavalier microphone fixtures. The hyper-cardioid polar pattern minimises noise and ambience at the off-axis (sides) of the microphone. The result increases directivity and provides high gain-before-feedback response when using near speakers or monitors. The wide frequency response of 50Hz to 20kHz minimises low-frequency noise caused by wind and proximity effect while reproducing audio signal with great accuracy and rich detail. The dual windscreen design employs an outer layer which disperses initial wind stream while the second layer further diffuses the wind stream before reaching the diaphragm. The module design allows quick and easy capsule replacement for added flexibility. 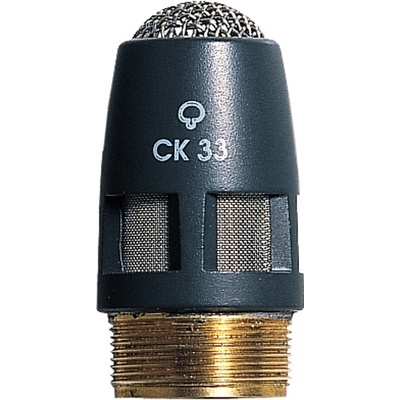 The CK33 is designed with a threaded connection for use with the GN series, HM 1000 or LM 3 microphone fixtures. The modular design offers quick capsule replacement and enhances flexibility. The hyper-cardioid polar pattern offers a 90 degree pick up area. The result minimises noise and ambient audio signal at the off-axis (sides) of the microphone capsule. The wide frequency response of 50Hz to 20kHz offers smooth, accurate audio reproduction while minimising low-frequency noise. The dual layer windscreen provides a primary layer which disperses the incoming wind stream while the second layer further diffuses wind flow before reaching the diaphragm.